Today, he says, the question comes across like we would be reading “a political novel or a conspiracy theory fantasy book mixing politics with police investigations, the game of nations and mafia wars. By the first week of the U.S. invasion thieves had plundered at least 15,000 items from Baghdad's Iraq Museum, many of them choice antiquities: ritual vessels, heads from sculptures, amulets, Assyrian ivories and more than 5,000 cylinder seals. "Every single item that was lost is a great loss for humanity," says Donny George Youkhanna, an Iraqi Assyrian archeologist, anthropologist, author, curator, scholar and former Director General of Iraqi Museums, now a visiting professor at Stony Brook University in New York. The Iraqi National Museum in Baghdad "is the only museum in the world where you can trace the earliest development of human culture—technology, agriculture, art, language and writing—in just one place…"
In the case of Syria now, Zein writes, the theft of antiquities for a rapacious international black market is thriving. He says antiquities plundered from museums and archeological sites in Syria are finding their way chiefly to (1) Beirut (2) Antakya, seat of the Hatay Province in southern Turkey, and (3) Erbil, capital of the Kurdistan Region of Iraq, by way of Qamishli, the city in northeastern Syria that is a stone’s throw away from the border with Turkey. Where Beirut is concerned, Zein suggests offices and shops are currently opening under all sorts of names to specifically market looted Syrian antiquities. “The ongoing devastation inflicted on the country’s stunning archaeological sites—bullet holes lodged in walls of its ancient Roman cities, the debris of Byzantine churches, early mosques and crusader fortresses—rob Syria of its best chance for a post-conflict economic boom based on tourism,” Aryn Baker wrote for Time magazine last year. 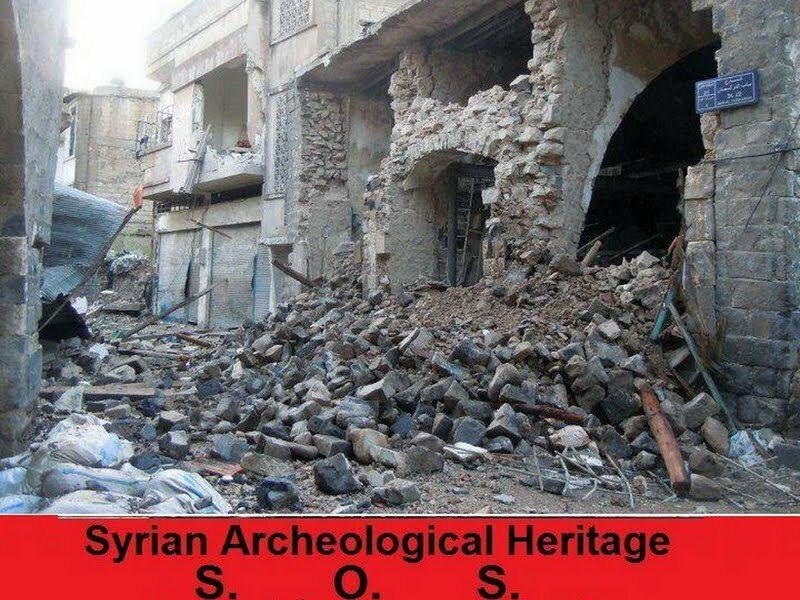 “All six of Syria’s UNESCO world heritage sites have been damaged by rocket, tank and small-arms fire, some ‘potentially irreversibly,’ according to archaeologist Emma Cunliffe, a PhD researcher at the United Kingdom’s Durham University who has just published a report during the course of her Fellowship at Global Heritage Fund, which details the destruction of Syria’s historical sites. “Syria has been at the crossroads of culture and religion for millennia. The world’s first agricultural societies are thought to have sprung upon its fertile plains, and Damascus is one of the longest continually inhabited cities in the world, with early temples dating back an estimated 5000 years. “Alexander the Great’s Macedonian lieutenants built vast cities in Palmyra and Apamea, and the Apostle Paul sheltered in Damascus after his conversion to Christianity. Some of the country’s Islamic mosques, still in use today, were built during the Prophet Muhammad’s time. “…The sheer diversity of Syrian antiquities -- everything from Mesopotamian cylinder seals, Roman statues, early Christian iconography, Jewish incantation bowls, and centuries-old Korans have passed through smuggler hands —means that the appetite for illicitly-acquired artifacts is unlikely to be sated. Zein says the looting and destruction of Syria’s past is taking place in Damascus and Rif Dimashq, Deraa, al-Jazirah area (which is extremely important archeologically), Idlib, Maarrat al-Nu’man (near the Dead Cities), Homs, Hama, and of course Aleppo. “Only crystal gazers would claim to know what is being looted from these places and sold to gangs specialized in marketing their loot in Western countries. “The heartbreaking reality -- or sneaking suspicion -- is that renowned Western museums have been the final destination of our stolen heritage through the ages. 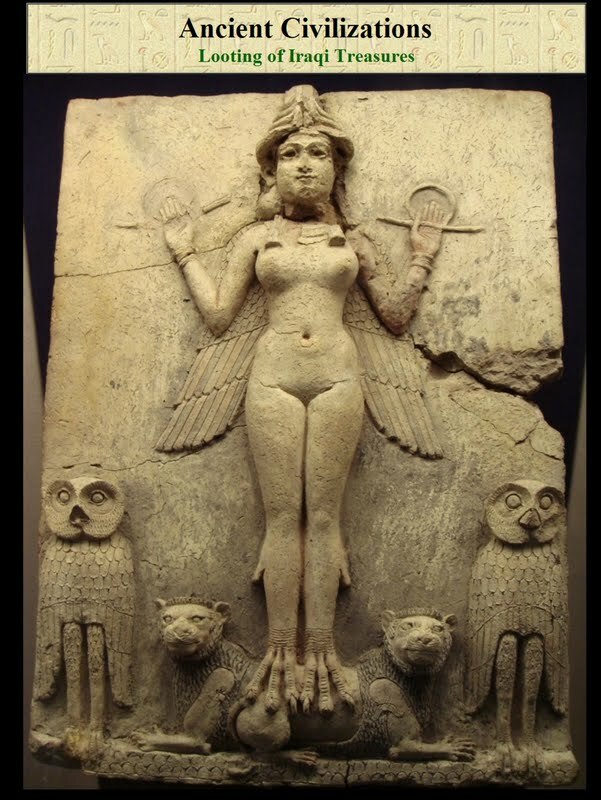 “Remarkably, the Iraqi government is still trying to this day to retrieve from a range of Western governments its stolen national treasures and priceless antiquities. It succeeded in some instances and failed in most others. Zein says historians have yet to determine if the modern-day looting of the Arab world did not start with Napoleon’s Egypt campaign. One of the most important treasures brought back from the campaign was the Rosetta Stone, which is now in the British Museum. In today’s Egypt, sophisticated and systematic looting is taking place across major archaeological sites. Satellite images from before and after the Revolution of January 25 show a marked increase in looter holes. In fact, parts of the landscape are starting to look like “Swiss cheese,” Deborah Lehr, chairman of the Capitol Archaeological Institute at George Washington University, who has been charged with helping the Egyptian government protect its antiquities, told the New York Times last October. Zein’s mind goes into fast forward to ponder the loss 10 weeks ago of ancient Islamic manuscripts in Mali’s fabled desert city of Timbuktu. It is not known how many of the priceless documents were destroyed by al-Qaeda-linked fighters who torched the Ahmed Baba Institute library. News of the destruction came last January 28 from the mayor of Timbuktu. With its Islamic treasures and centuries-old mud-walled buildings including an iconic mosque, Timbuktu is an UN-designated World Heritage Site. The damage caused by the fleeing fighters was limited, but irreplaceable treasures were lost. 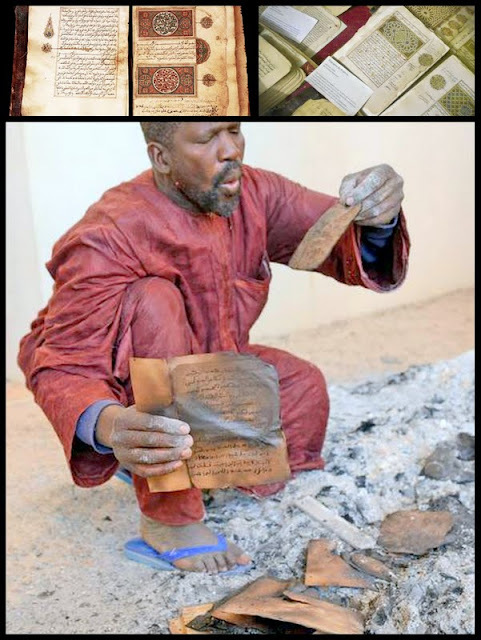 The documents date back to the late 12th century, the start of a 300-year golden age for Timbuktu as a spiritual and intellectual capital for the propagation of Islam on the continent. In a VOA interview, Michael Covitt, chairman of Malian Manuscript Foundation, said the 30,000 manuscripts cover a wide variety of topics. “The manuscripts cover pretty much every science under the sun, from astronomy to astrology to numerology to mathematics to medicine to jurisprudence,” he said. All are in Arabic script, in the Arabic language and African languages. Zein says, “Because of the preplanned Iraq National Museum precedent, I initially cast doubt on the story of rebels torching the library in Mali. I then thought the story might be plausible in view of the rebels’ brutality and fanaticism. “Still, my nagging questions: Did the rebels do it? What happened to the manuscripts that weren’t lost? Why did the media embedded with French troops at the time remain close-mouthed on the whereabouts of the spared manuscripts? “The questions remain open-ended because whereas the looting of the Iraqi National Museum coincided with U.S. forces storming Baghdad, the torching of the manuscripts preceded the storming of Timbuktu by French troops.